Description: if the appeal of a classic farmhouse were distilled for today, this would be the result. 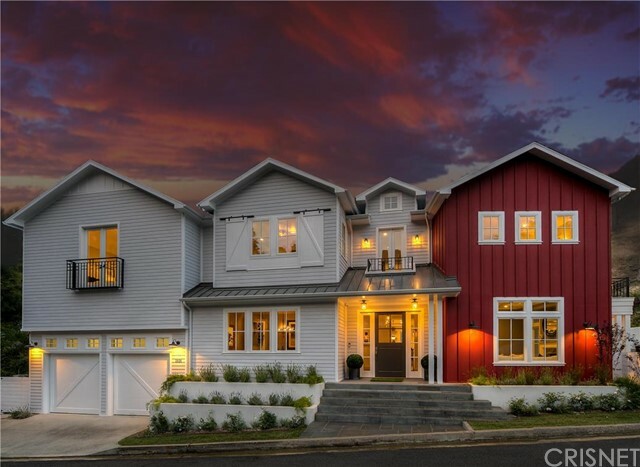 newly built in sherman oaks hills s. of ventura blvd., combines expressive farm house motifs:tall windows,sliding barn doors, wall /ceiling paneling,wainscoting, transoms, wide-plank flooring with echoes of softly worn pine,full modern amenities,custom fixtures, finishes & tilework. open, airy floor plan. chef?s kitchen with granite counters,tall custom cabinetry, farm sink, large center island, cozy seating. thermador appliances,6-burner range. butler's pantry w/wine cooler. sliding barn doors open to formal living rm with fp adjoining spacious fam. room w/folding glass doors opening to covered patio. pool/spa with waterfall, fire pit, bbq with seating,side wraparound patio. 1st floor has en suite guest bdrm opening to back yard, powder room, cable-ready office. 2nd level landing with juliette balcony. nearby playroom or 6th bdrm. serene master suite with sitting area, fp, balcony, built-in cabinetry, walk-in closet. spa-like master bath with custom dual vanities, soaking tub, steam shower. 2 more bedrooms, and baths with wz tiles, carrera marble floors. laundry room, 2-car garage with dual roll-up doors, camera security system. classic americana for the modern age. Listed By: Beatrice Stambulski of John Aaroe Group Inc.